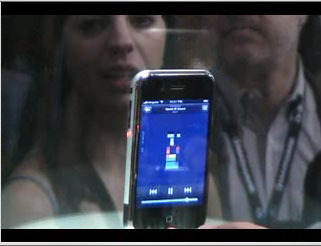 At MacWorld 2007, the iPhone was available for viewing in demo mode rotating in a case. My-oh-my that IS a gorgeous little gadget! I’m jealous! I would have given anything to get near that case! Perhaps it is just me (and really, it is likely just me) I am soooooo disappointed that they didn’t introduce a widescreen video iPod that isn’t a phone. I was really, really counting on it. I still don’t own a video ipod had high hopes for a major improvement this year. But not THIS major an improvement! Since I recently bought my beloved treo that runs all my medical software (OSX does not) I cannot justify spending $500 on this when I can spend half that on a new video ipod. …but that screen! How am I going to live with a plain ol’ video ipod knowing that gorgeous giant screen is out there!